Vigilante Laboratories is one of the first shops that I made a purchase from when I started shopping etsy last year. Vigilante designs and makes custom clothing and accessories with a unique perspective. Their clothing is original yet comfortable and practical to wear. Lianna K and A J Machete are designers that describe themselves as restless and relentless. Their energy and vision created Vigilante Labs. They have struck out on their own leaving the Department stores in the dust. Part comic book and part deconstruction. They say they want to design clothing for superheroes. I think they are all that and more. I own and wear their Kingyo top. 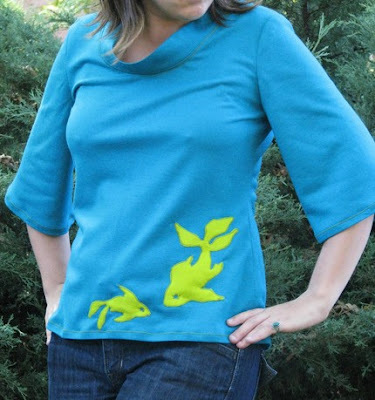 It is a beautiful teal blue wool jersey top with appliques of goldfish in lime green. Kingyo has a beautiful cowl neckline and wide kimono sleeves. The attention to detail is wonderful. The top stitching in the Kingyo top is all rickrack design and in the same lime green color of the fish applique. The design is flattering and the fit perfect because Vigilante Labs guarantees the fit. They are plus size and petite friendly and made the top to fit my plus sized form! Check out their shop policies for details of their guarantee. 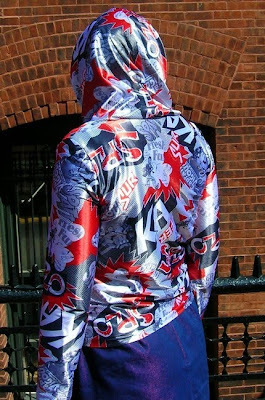 I purchased their Satin Comic Book Hoodie for my daughter. She is a beautiful size 10 who is 6 feet tall in stocking feet. She is a super hero in her hoodie and it fits her long arms and torso perfectly due to the custom tailoring of Vigilante Labs. Shop Vigilante Labs and their new menswear store A J Machete and Sons fine tailoring for custom clothing that is as individual as you are. Size 8 now, Mom. It's one of the pieces that made the wardrobe overhaul from resizing -- is perfect for layering over a long-sleeve tee and under my denim jacket! I'm glad you can still wear it you svelte city girl you!